Traditionally the meat for tagines is not browned (Moroccans would no doubt frown on this) but I think it gives the dish a better flavour and appearance. Grind the cumin and coriander together. Heat 75g butter in a large casserole and brown the lamb on all sides. Remove the meat and set aside. Add all the spices (except the saffron), and the garlic and onions; cook for 2 minutes. Season and add the stock. Add 2 tbsp honey and about a third of the coriander. Bring to the boil, return the lamb to the casserole, then turn down to a simmer. Cover and cook over a low heat for 1½ hours until meltingly tender. Meanwhile, put the quince in a small saucepan and cover with water. Add the lemon rind, juice and the remaining honey. Bring to the boil, then simmer for 15–20 minutes until tender. 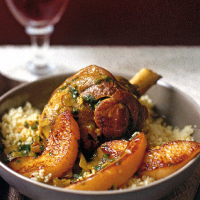 When the lamb is cooked, remove the shanks and cinnamon stick and keep warm. Add about 4 tbsp of the quince poaching liquid, the saffron and its water. Bring to the boil and reduce to a thickish sauce. Taste and season. The Corker recommends- The rich exoticism of a Spanish blend melds seamlessly with the complex spicing and sweetness of such a subtle tagine.